Jonathan Ryan, a Muscatine native, is in his sixth year as Head Choral Director at Muscatine High School. Mr. Ryan is a 2012 graduate of the Music Education program at St. Ambrose University in Davenport, IA where he was actively involved in the Concert Choir as well as Bee Sharp (a men’s glee choir), STAMVOJA (a jazz and pop acapella group), and the St. Ambrose Theatre Department. Mr. Ryan currently directs Concert Choir, Acapella Choir, and the MHS Show Choirs, River City Rhythm and Encore. 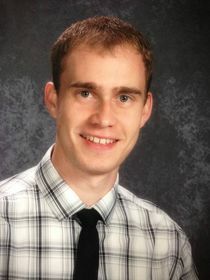 Prior to teaching at MHS, Mr. Ryan spent one year teaching in West Burlington, Iowa, teaching 6 – 12 music at West Burlington High School and Intermediate School. Mr. Ryan feels very fortunate to be able to teach in the same choir rooms that encouraged his current love for choral music, and enjoys being back in a city where he is nearly guaranteed to see someone he know anywhere he goes.